When thinking about investing in a pressure washer, it is important to first consider the types of jobs you’ll be doing. PSI stands for pounds per square inch. This is the weight of the pressure coming from the hose. Another consideration is the GPM, or gallons per minute. GPM refers to the number of gallons of water used per minute. The higher the pressure and the more water used, the deeper clean you are going to get. The pressure is the part that pulls the dirt and grime off the surface you are cleaning, and the amount of water is the rinsing power for that dirt. It is important to consider GPM as much as PSI since a powerful PSI but weak GPM would leave a pile of mud and debris that will be a headache to break apart if it won’t rinse away easily. Many pressure washers calculate cleaning power by CU, or cleaning units, which is the PSI number multiplied by the GPM number. While this is an important factor to consider, it is important to note that a consumer should still examine the specific PSI and GPM since a unit with 3000 PSI and 2.0 GPM carries 6000 CU, while a unit with 2000 PSI and 3.0 GPM has the same CU. Pressure washers general perform at a range of PSI and GPM, but you will not be able to find a unit that carries the smallest pressure to the largest pressure. They are divided into three categories: electric, residential, and commercial. An electric power washer is going to have the lowest PSI range, generally, it is between 500-4000 PSI with 1.0-4.0 GPM. 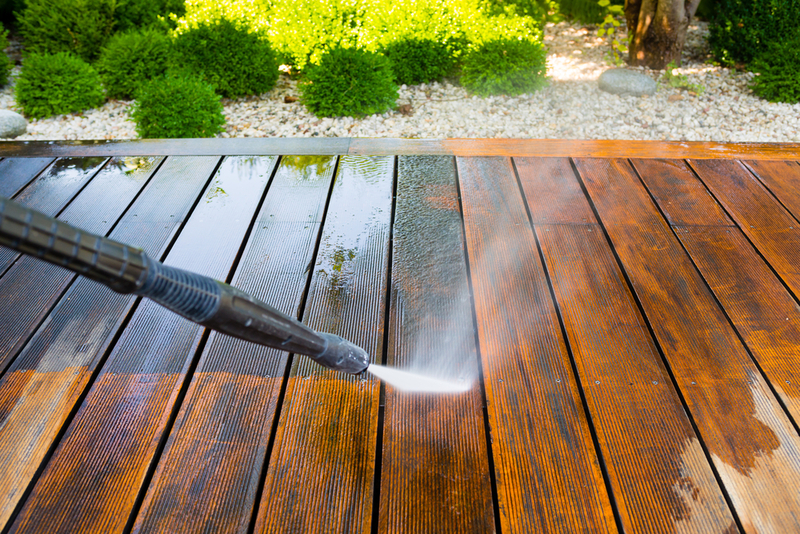 An electric pressure washer is an ideal unit for smaller projects like cleaning tires, grills, patio furniture. They are extremely lower maintenance and tend to be fairly quiet. Since it uses electricity, you cannot use an extension cord so you are limited to where you can use it. While it is possible to tackle larger jobs like concrete or wood panels with an electric pressure washer, it will take a significant amount of time compared to a gas powered residential washer. Gas powered, residential washers are great for household projects that you may use a couple times a year. PSI will range from 2700-4000, with 1.0-4.0 GPM. This size of a pressure washer is great for concrete driveways, windows, decks, and house exteriors. Gas powered units will produce carbon monoxide, so it should never be used in an enclosed area. Stick to an electric unit for things like the interior of garages or sheds, even if it is a tough job that would require more CU’s. It will take longer, but you will not run the risk of potentially harmful effects from carbon monoxide. A commercial pressure washer is for the toughest, biggest jobs and generally ones used by professionals. These units would be good for more frequent use and generally use 1000-7000 PSI, and 1.0-10.0 GPM. Some pressure washer unit will come with accessories to get more force from the unit, or you can purchase accessories. The most common are interchangeable nozzles that change the force and narrowness of the water. They range from 0 degrees to 40 degrees, with 0 being the most force. Consumer Reports does not recommend using 0 degrees as it can often damage or cut property and can seriously injure someone. As a rule of thumb, you should use the lowest setting needed to get the job done. While it may be satisfying to watch a more forceful pressure, it can lead to significant damage. It is also a good idea to test the area first to determine the appropriate amount of pressure to get the job done, without cutting into the surface. If attempting to use a pressure washer during the winter months, do not assume that more pressure means that it will help clean a colder surface. Antifreeze can be incorporated into some pressure washers if you must use it during the winter. Otherwise, operate a pressure washer only on sunny days with little wind to get the best results. Determining the appropriate PSI level can be a challenge as it really depends on the type of surface and the amount of dirt, grime, or debris. As a guide, a concrete driveway with a medium level of dirt would pair best with around 3000 PSI and 4.0 GPM to get the best, most effective and time efficient clean. Pressure washing your driveway can help reduce wear and tear on the concrete and boost the appearance of your home without breaking the bank. Pressure washers can remove mildew, grime, and stains from driveways. Detergent can be applied in the pressure washer to really soak the driveway clean. A special nozzle is required for the pressure washer so soap can be applied in a softer manner that the force of the pressure. The detergent will break away the stains so it is all set to be pushed away by the force of the pressure washer. Normal soap should not be used as a detergent as it will foam and do little to really pull apart the tough dirt and grime. Amazon offers a Multi Purpose detergent that works on different surfaces including concrete, wood, tile, stone, and brick. Pressure washing the exterior of your house can brighten your home more than you can imagine. We don’t tend to think about the amount of dirt that gets stuck along the side of our house over time until all of a sudden your bright house suddenly looks gray or has black splotches across the panels. Once you realize it’s time for your house exterior to get a fresh look, you’ll first want to make sure that your home was not painted with lead paint. Generally, if the house was built or renovated prior to 1978, you should have a professional inspect the paint. If pressure washing your whole house, you’ll definitely want to start with a gas powered pressure washer. The electric washer will not provide enough PSI and GPM to get a good clean and would restrict you to cleaning small sections at a time. Starting with at least 2.3 GPM will ensure that the dirt will not just be moved around the side of your house and will actually wash away. Pretreat the house by cleaning with a detergent and scrub as best as you can before you begin the pressure wash. This will help treat mildew stains or really tough build up. Once you do that, pressure wash with a multipurpose detergent like the one recommended for driveways above. You will get a streak-free finish when using a detergent versus using just water. While the PSI and GPM are the most important factors in pressure washing your home exterior, it is just as crucial to perform any pressure washing as safely as possible. It is recommended that you turn off electricity and to check for power lines before you begin and avoid exterior outlets and lights. Even small jobs still use a great deal of pressure, so stand firmly while operating any pressure washer. When using a ladder, assess the positioning of the ladder before you begin and do not try to fight the fear if you are uncomfortable. Using a pressure washer requires two hands and if you are feeling uneasy it is much safer bet to hire someone than risk serious injury. While operating the washer, keep the nozzle moving and do not try to move it closer to get a stronger clean. Do not blast corners or window edges to avoid splatters or cuts in the surface.